Female service members now will receive 12 weeks of paid maternity leave, Defense Secretary Ash Carter announced on Thursday, one of several personnel initiatives aimed at improving the quality of life for military families. The move doubles the amount of current paid maternity leave available to most service members, and is four weeks longer than the average eight weeks provided by many employers in the United States. However, it’s less than the 18 weeks of paid maternity leave that Navy Secretary Ray Mabus announced in November 2015 for sailors and Marines. Carter said that sailors and Marines who are pregnant now, or conceive within the next month, are still eligible to take the full 18 weeks of paid maternity leave per that policy. "I don't take lightly that 12 weeks of maternity leave represents a downshift from what the Navy pursued last summer, but I believe that we will be at the forefront in terms of competition, especially as part of the comprehensive basket of family benefits we're providing across the joint force," said Carter. Sen. Richard Blumenthal, D-Conn., praised Carter's effort to double the amount of leave for female service members in the Army and Air Force, but said he was "disappointed that achieving parity across the services meant reducing leave in the Navy and Marine Corps." Defense also wants to boost paid paternity leave from ten to 14 non-continuous days, Carter said, encouraging men to take the leave currently available. Other benefits announced include extending the department’s child care development centers to at least 14 hours a day; installing rooms at DoD facilities for new mothers to breastfeed comfortably; and pursuing an amendment to existing statutory authority allowing service members to postpone moving to a new duty station if they decide that it’s in the best interest of their family to stay put. Frequent moves – a fact of military life – add extra stress on military families, and are often why people leave the service. Carter said the changes – the second package of personnel reform efforts that he has rolled out as part of his larger Force of the Future initiative – are aimed at three areas: recruiting, retention, and career and talent management. During the Thursday press briefing, Carter cited statistics related to the growing number of women serving in the armed forces, the benefits of providing new parents more time with their babies, and the importance of increasing family benefits to continue to attract and maintain an all-volunteer military. “While you recruit a service member, you retain a family,” said Carter, referring to a well-known and accurate adage in the military community. 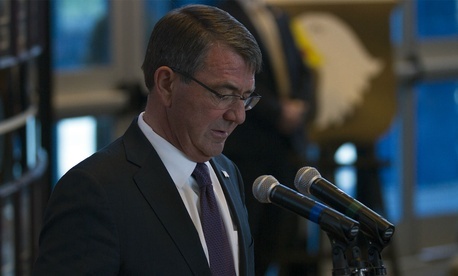 Carter said that 52 percent of the enlisted force, and 70 percent of the officer corps is married. In addition, there are 84,000 military-to-military marriages, he pointed out. Click here for the full list of leave and other family-friendly benefits Defense announced on Thursday.